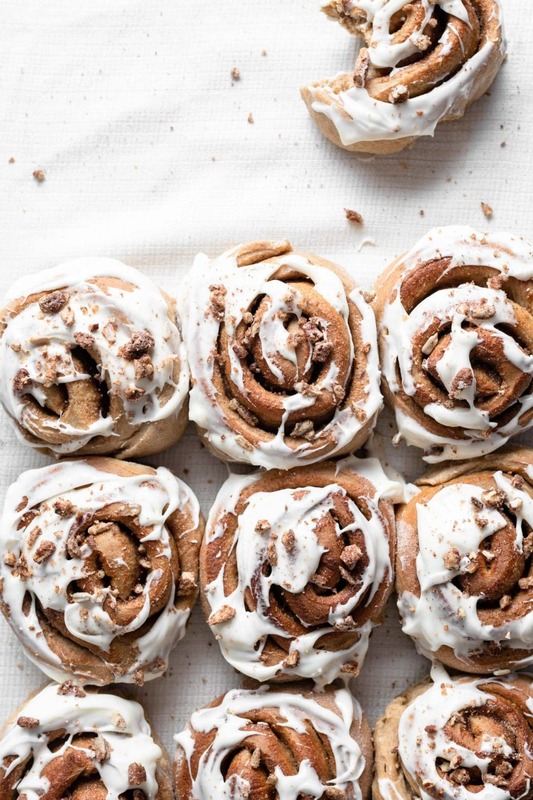 Are you a fan of Cinnamon Rolls?! 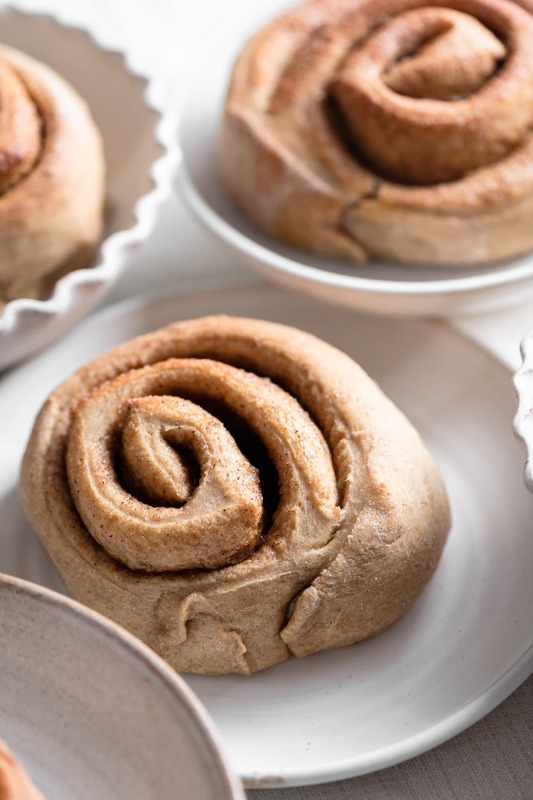 Those warm ooey, gooey hot cream cheese frosted bread rolls full of cinnamon are so irresistible. I mean my nose basically turns into overdrive and rotates my body into their direction. Let’s be real here, I know I’m not the only one who salivates when I smell them in the mall. The filling is not the only delicious part of a sweet roll, the dough can be full of flavor too! I’m talking creamy sunflower butter flavored dough. That’s right, a combo of sunflower butter, cinnamon, brown sugar, cream cheese, with candied pecans and sunflower seeds. I hope you just drooled. 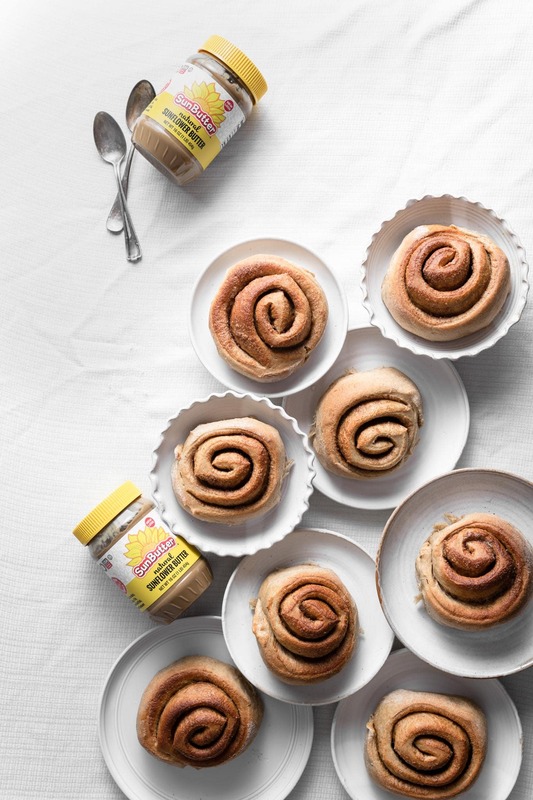 For this recipe I partnered with SunButter to create a tasty version of the classic sweet roll we all find so scrumptious. 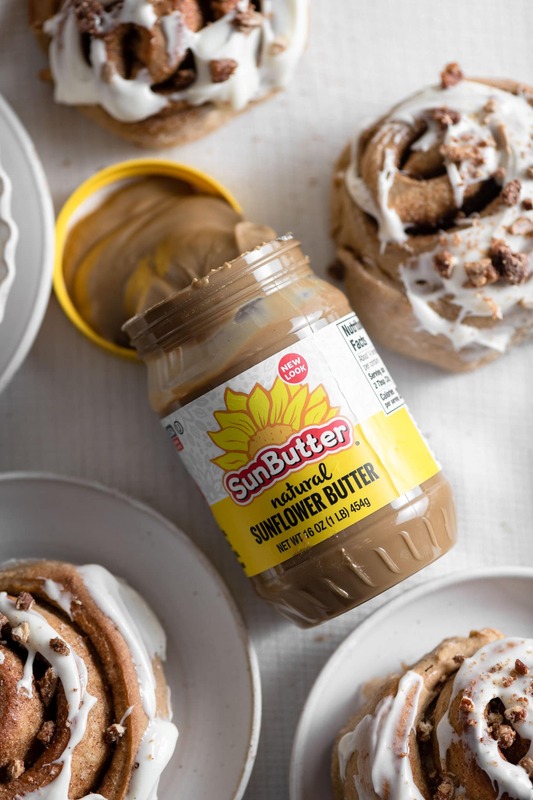 SunButter is made from roasted sunflower seeds and processed into a creamy nut butter like consistency. With more health benefits than traditional nut butters & free from the top 8 food allergens, its an obvious choice. Pillow soft jumbo cinnamon rolls can be on your breakfast table and in your mouth in no time. All you need to do is set a side a little time for the dough to rise. You can even make them the night before. Just hold off adding the frosting and candied nuts for the next day when you warm them up. Whisk together half of the warm milk with your Sunbutter to make it a more liquid consistency before adding to your batter. Punch down excess air from the risen dough before rolling out. Roll your dough out to the size of a cookie sheet, keeping it 1/2 inch to 3/4 inch thickness for nice fluffy rolls. For extra sunflower butter flavor mix a few Tablespoons of Sunbutter with your melted butter for painting on your rolled out dough. Then sprinkle with cinnamon sugar. Once you roll up your cinnamon covered dough. Seal the long crease with a little egg wash (one egg and a tbsp of water stirred together). 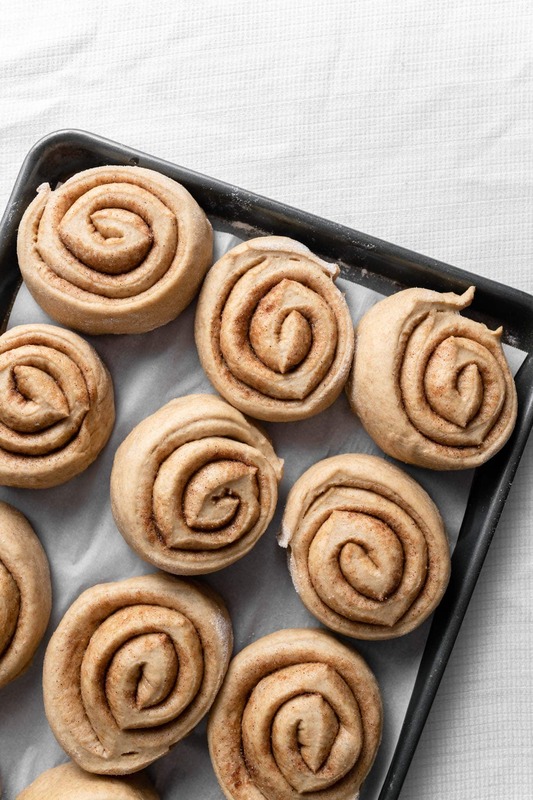 Set your large coiled cinnamon roll dough with filling in the freezer for about 10-15 minutes before slicing into individual rolls. This helps keep the shape when cutting. 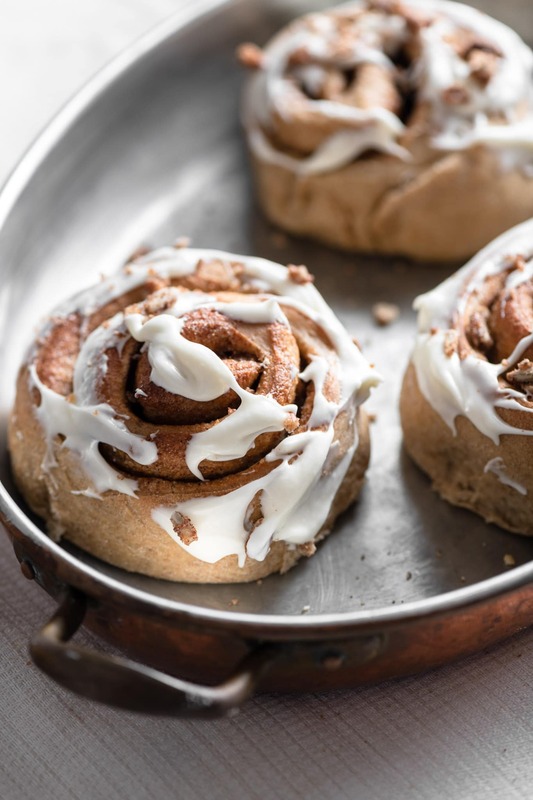 Place your individually cut cinnamon rolls on a large baking sheet leaving an inch or two space between them. During the second rise or proof, they will puff up and fill in the gaps. Use room temperature cream cheese and butter for your frosting. When making your candied pecans and sunflowers, stir a couple times during baking to prevent burning. 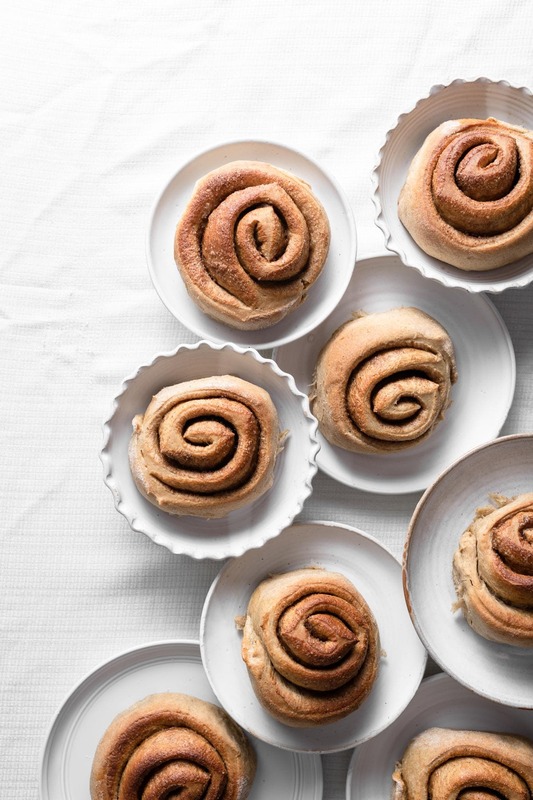 Store frosted cinnamon rolls in the fridge in an air tight container for up to 2 days. 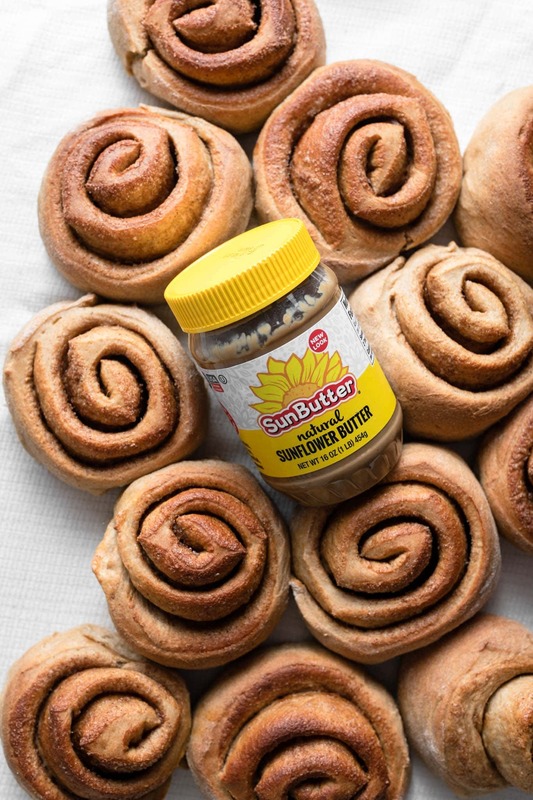 This is how they should look before going in the oven..
Sunflower Butter Cinnamon Rolls Recipe is Sponsored by Sunbutter. All thoughts and text are my own. Thank you for supporting the companies that help make Two Cups Flour possible. 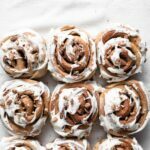 Check out these Sweet Potato Cinnamon Rolls too!! 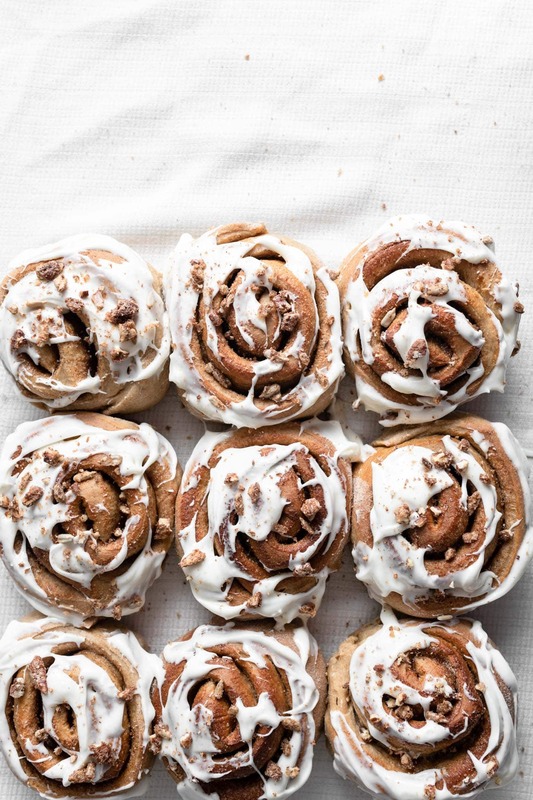 Sunflower Butter Cinnamon rolls made with creamy Sunbutter, Cinnamon, Cream Cheese Frosting, then topped Candied Pecans and sunflower seeds. In a large bowl, hand whisk together sifted whole wheat flour, bread flour and salt. Set aside. In bowl of stand mixer gently stir together yeast, sugar, and 1 cup warm almond milk. (hot milk will kill yeast). Let sit about 10 minutes until frothy. Using a separate small bowl stir together the remaining 1 cup of warm almond milk with the Sunbutter until smooth. Using the paddle attachment on medium high speed, add the eggs, melted butter and Sunbutter mixture to the yeast. Blend until incorporated. Scrape sides and bottom of bowl while mixing. Switch to dough hook attachment. Slowly spoon flour mixture into batter while on medium speed. You may have to push flour down into batter with spatula from the sides of bowl. Once all the flour is added, increase to medium high and beat until a smooth dough is formed. Pull a small piece of the dough off and spread it thinly with your fingertips. If you can see light through the dough without it breaking, then there is enough gluten formed and the dough is ready. (This is called the Windowpane test). Transfer dough into a plastic bowl that had been thinly coated with butter. Cover with plastic wrap and place in a warm draft free location until doubled in size. Usually 1-2 hrs. Once dough had doubled, remove plastic wrap and with your fist punch down excess air. Using a pastry brush paint your melted butter across the dough leaving a small border around the edges. Coat your butter by sprinkling your cinnamon sugar mixture evenly across. Next roll your dough inwardly and lengthwise. Transfer roll onto a large tray and place in freezer for about 10 minutes to firm before cutting (optional). Cut into 2 inch slices for 12 rolls. Arrange rolls into onto large parchment paper lined cookie sheet. Place them 1-2 inches apart to allow for second rise. Next add vanilla and powdered sugar. Blend on low speed until the powdered sugar is just combined. Increase to medium high speed until desired consistency is reached. Add more powdered sugar as needed. I would make these while my dough is doing its first rise and then save for later. Simply mix tall ingredients together in a small bowl, adding nuts and seeds in last. Make sure there is an even coat of sugar on the pecans and sunflower seeds. Pour onto a parchment paper lined cookie sheet, spreading into a thin layer. Bake at 300 F for about 10-12 minutes until crispy. Stir a couple of times to prevent burning. Set aside to cool. 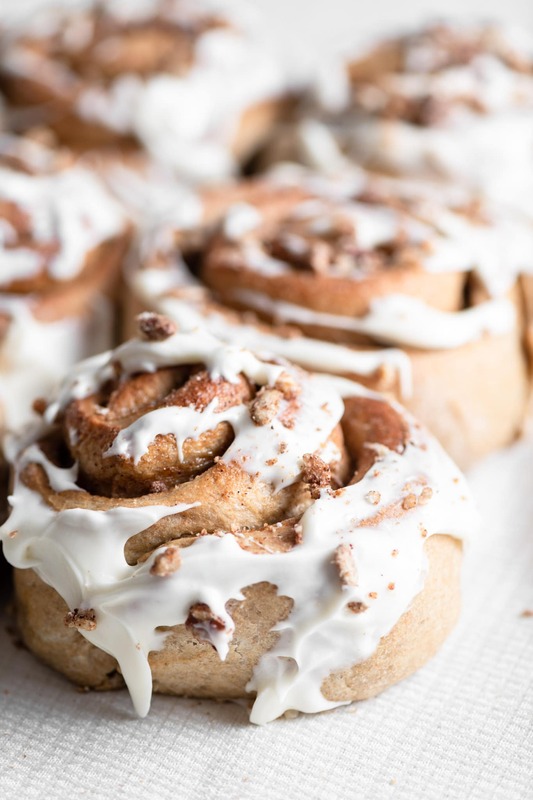 Remove cinnamon rolls from oven and coat with cream cheese frosting. Sprinkle with candied nuts and seeds. Serve warm!!! I got lucky enough to sample these and they are DELICIOUS! 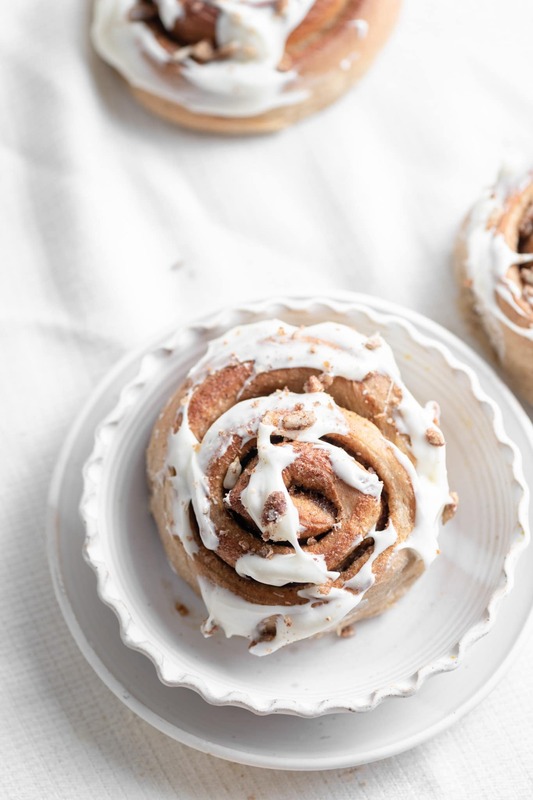 Such a good twist on homemade cinnamon rolls. Highly recommended!